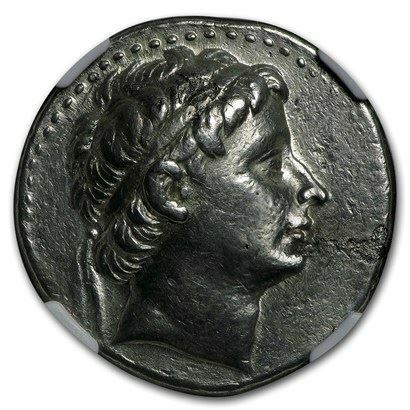 Seleucus II was a ruler of the Hellenistic Seleucid Empire, who reigned from 246 to 225 BC. After the death of his father, Antiochus, he was proclaimed king by his mother, Laodice in Ephesos, while her partisans at Antioch murdered Berenice and her son, another Antiochus. This dynastic feud began the Third Syrian War. Ptolemy III, who was Berenice's brother and the ruler of Egypt, invaded the Seleucid Empire and marched victoriously to the Tigris or beyond. Seleucus managed to maintain himself in the interior of Asia Minor. When Ptolemy returned to Egypt, Seleucus recovered Northern Syria and the nearer provinces of Iran. Seleucus never fully recovered his domain, which were ruled for almost 10 years by he pretender alled Antiochus Hierax. Hierax eventually died as a fugitive in Thrace, but Seleucus II would not capitalize on this, as he himself was killed by a fall from his horse in 225 BC. He was succeeded by his elder son, Seleucus III Ceraunus, and later by his younger son Antiochus III the Great.